Are you the type who’s always clowning around? Well, look no further for the perfect accessory to your sense of humor. 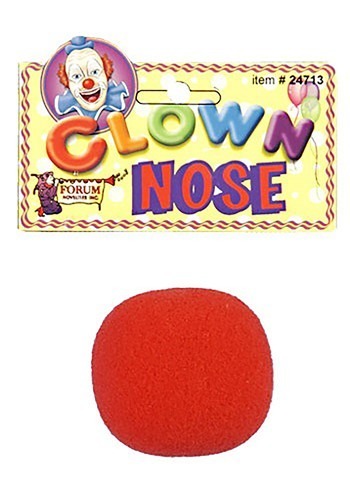 There’s nothing more classic than a Clown Nose! Of course the big, round, red nose is synonymous with the zany antics of these chuckle-inducing tricksters. Remember when you were a kid? No circus show was complete without these dawdling, bumbling, and sometimes fumbling characters. Now you can find them at almost any event, or maybe in your own mirror. If you’re the type who always has something up your sleeve, you might want to add one more thing…the cherry on top, if you will. Whether you’re the instigator of endless jokes, gags, pranks, or silly slapstick humor. Let the fun begin, and the secret to every clown’s success is makeup, a wig, some gloves, and of course…don’t forget the nose! the clown nose was ok. really a little bit of red color was just as good if not bette.r the actual clown nose doesfall off at times.